As anticipation builds towards its opening on 21 December, the Shinta Mani Wild- Bensley Collection team is set to unleash a host of wild bespoke Bensley experiences that exemplify the camp’s spirit of fun and adventure, promising authentic interactions with the incredible national parkland setting – all with a twist of Shinta Mani style. 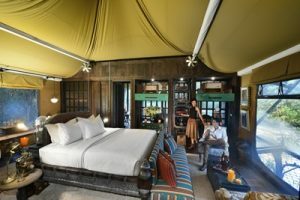 From the exhilarating moment of arrival – criss-crossing the rapids via a 380m zipline – there will be no such thing as a typical day at Shinta Mani Wild – Bensley Collection, a radical new concept for a luxury tented camp nestled deep in Cambodia’s South Cardamom National Park. Guests that share Shinta Mani Wild – Bensley Collection’s passion for protecting its precious natural environment might find themselves joining Wildlife Alliance rangers motorcycling through the forest on anti-poaching patrols and tracking previously unrecorded wildlife activity. Funded by Shinta Mani, the camp’s ranger station enables the non-profit Wildlife Alliance to carry out vital conservation work in the area, including protecting animals from poaching, removing snares and preventing illegal logging. Guests can traverse the secret estuary backwaters on luxurious six-metre pontoon-style boats designed by Bill Bensley – so naturally they each have a fully-equipped bar and a top deck with daybed and sun loungers. Guests can drop anchor wherever they please, whether to explore the mangroves by kayak or enjoy a truly wild BBQ of freshly caught crab prepared by their on-board Bensley Butler. Discovering – and tasting – Cambodia’s natural larder in the company of expert naturalists is next on the agenda. One of the camp’s resident botanists, an orchid-aficionado, recently discovered an entirely new species of the exotic flower growing at the camp, alongside fragrant wild vanilla. The naturalists will guide guests through the forest on their daily forage so they can walk away knowing their krasang from their mangoseen and their angkeadei from their Moringa. Post-forest immersion, the head Chef will teach guests how to transform the indigenous Cambodian herbs and plants into flavour-packed dishes around the campfire. Current foraged favourite of the Shinta Mani Wild team is a jungle fruit named kuy, which tastes like the lovechild of an orange, mango and passion fruit. All of this adventuring calls for some well-deserved rest and relaxation. Step forward the Boulder Spa, whose chemical-free treatments feature reviving Khmer tonics made from medicinal plants foraged from the rainforest and bottled onsite. Living up to its name, the spa’s two treatment rooms are set amid dramatic natural boulders, but the river takes centre stage, too: guests can enjoy a river-stone foot massage while soaking in a waterfall pool. Alternatively, guests may choose to unwind amongst nature by trying a Cambodian take on tenkara: a meditative form of Japanese catch and release fly fishing. Shinta Mani Foundation will be spearheading the camp’s conservation and community outreach programmes, including providing long-term employment opportunities to the local inhabitants where there is minimal infrastructure and fewer work prospects. Shinta Mani Wild – Bensley Collection, in conjunction with the Foundation, will nurture its natural environment through partnerships with respected conservation organisations including Wildlife Alliance, The Royal University of Phnom Penh and The Cambodian Government. This extreme exercise in ingenuity will enable guests to explore this pristine wilderness, while making the lowest possible impact on the land, offering a luxury adventure with intimate access to one of Asia’s most stunning forest ecosystems. 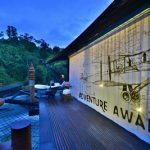 Rates at Shinta Mani Wild – Bensley Collection will start from USD1,900++ per night, inclusive of all food and beverages; all private guided activities and excursions; unlimited spa treatments; personal Bensley Butler and land transfers from Phnom Penh or Sihanoukville airports. Helicopter transfers are additional. A minimum three night stay is required and a minimum age of 13 years.